For this weeks homework you will complete an SQ3R on the text below. – Survey the text > Pick out key words and ideas by scanning the text. – Ask questions > Ask questions by using your key words and ideas. – Read the text > Read the text and write down the main ideas/important parts of the text. – Recite > Answer your questions with some some evidence. You may need to infer some of your answers. Review > Write a summary about the text in your own words. Include your own opinion and inferences about the text with evidence to why you thought that. 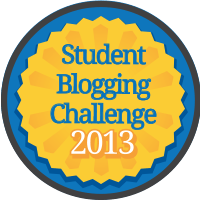 Write your SQ3R as a blog comment or it can be hand written on a piece of paper and pasted into your reading response book. Why wasn’t it Red Saturday? How did the temperature reach so high? Did the 400 fires spread or burn seperate? How did they know how much acres were burnt? 7th of February 2009 Victoria, Australia. Some of the worst bushfire weather conditions ever recorded. 2 months of extremely low rainfall and hot dry conditions. The radiant heat produced in some instances was capable of killing people from 400 metres away. It was estimated the energy in the Black Saturday bushfires, was equivalent of 1,500 Hiroshima atomic bombs. It was Black Saturday because of all the smoke and ash flying through the air, and the time of the day was night, which is why they could’ve called it “Black” Saturday. The temperatures were very high because it was a very, very hot night, and some of the fires could’ve linked together to make them larger. Approximately 400 fires started during the day of the Black Saturday bushfires. I infer that they keep track as they probably flew through helicopters, counting each one. Or an easier way, they could’ve called up each of the groups of fireman who did 1 set of fire each. I think it is absolutely horrible to live through such terror of a bushfire that can smother throught your face and block all of your airways. I feel terrible for the people who had to survive this, or risk their lives to this horrible incident. I inferr the fire started as a massive heat wave struck through Victoria, and the nature couldn’t handle it anymore. I would have no choice but to die because I wouldn’t have any idea what to do in a situation like that. I partly was in that and my nose was awfully filled with the rotten smell of smoke and fire. My opinion is that it was one of the most terrible fires that I have ever seen, and that I will ever see. 1. Did someone lit it. 2. Did people die from the heat. 3. Why did it happen in 2009. 4. How wide did the fire go. 5. How many people die. On the 7th of February 2009 the worst fire hit Victoria killing 120 people and weather conditions on the day were bad and the speed was 12 km and the fire traveled up to 600 per every 30 seconds. Black Saturday was named that as of the black smoke, the intense heat of the fire and the people who had suffered,died and lost there homes. And how far the fire had traveled and how quickly. How long did the fire last for? Did someone lite the fire? Some of the worst bush fire weather conditions ever recorded. 2 months of extremely low rainfall and hot dry conditions. It was estimated the energy in the Black Saturday bushfires, was equivalent of 1,500 Hiroshima atomic bombs. Why was it called black Saturday instead of red Saturday? How many people lit fires on black Saturday? Why would people risk lighting fires on a fire ban day just to burn some wood but it probably would kill someone? Why did anyone have to do this? Approximately 400 fires started during the day of black Saturday bushfires, in the evening a cool change came from the south west, although this did lower the temperature, it brought winds in excess of 120 kilometres. These winds the long flanks of black Saturday Bushfires into large fonts. Black Saturday was named after the colour of the smoke because you were in the smoke and could not see a thing, it would just be pitch black. I believe that over 400 people lit these fires. I believe that people risk lighting these fire because they thought the were doing no harm but altogether they killed 173 people. People would light fires just to burn wood. Black Saturday killed 173 people and injured 414. 400 fires were lit on February 7th 2009 also known as black Saturday. 7562 people were left homeless by this terrible bushfire. Winds over 120 kilometres directed the bushfires. How may people that be died? How did the fire go high like that? Some of the worst bushfire weather condition ever recorded. 2 mouths of extremely low rainfall and hot dry condition. 400 fire stared during the day of the black Saturday bushfire, 12km per hour. Some of the worst bushfire weather conditions ever recorded. 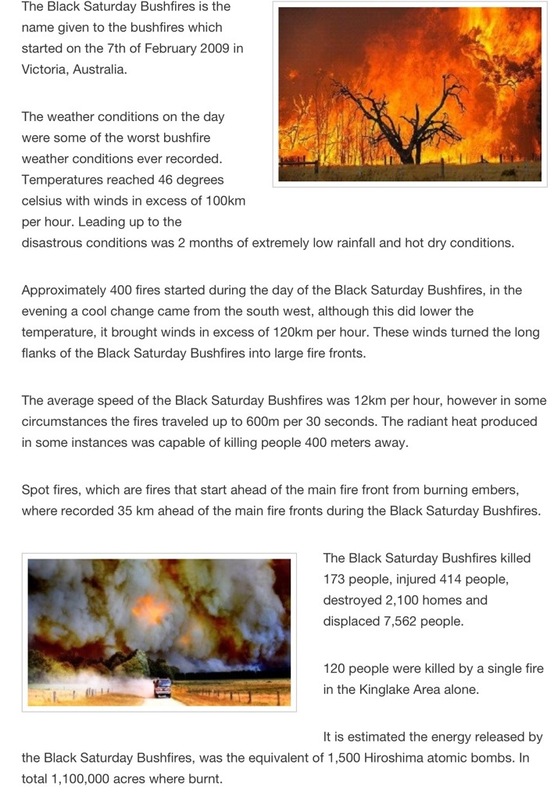 The black Saturday bushfire was the equivalent of 1,500 Hiroshima atomic bombs. Black Saturday was name that as of the black smokes, because of all the smoke and ash flying through the air, and the time of the day was night which is why they could’ve called it black Saturday. The temperatures were very high because it was very hot at night so some of the fire could’ve linked together to make them larger. Approximately 400 fries started during the day of the black Saturday bushfire. I infer that they just keep track or an easier way they could’ve called up each of the group of the fireman who I set of fire each. Black Saturday bushfires, 173 people killed, 414 people injured, 2,100 homes destroyed, 7,562 people displaced. How did the black Saturday bushfires start and end up killing lots of people? How come the people didn’t evacuate as fast as they could if they saw the fire before it came close to them? How did the people get hurt if people got hurt as well and they didn’t end up dying? Where are the people that have lost their homes going to be staying? How were 7,562 people displaced if it was just a bushfire? Approximately 400 fires started during the day of the black Saturday bushfires was 12km per hour, however in some circumstances the fires travelled up to 600m per 30 seconds. The radiant heat was produced in some instances was capable of killing people 400 meters away. 120 people were killed by a single fire in the Kinglake area alone. It is estimated the energy by released by the Black Saturday Bushfires, was the equivalent of 1,500 Hiroshima atomic bombs. In the total of 1,000,000 acres where burnt. The weather conditions on the day were some of the worst bush fires. I’ll do the rest of the homework later. The rest of my homework. The fire started because the weather conditions were some of the worst bushfire conditions ever recorded. I think that the bushfire happened because the weather was really hot and the grass must have caught on fire because they were really dry and the sun was burning them and the grass was just turning into dry and steaming grass that could have caused the fire at first. The people didn’t evacuate as fast as possible because the fire was moving really fast and it caught them too quickly. I think that people that lost their homes will be staying at cousins or relative family homes. I think that people were displaced because the fire was huge and people didn’t know were places where and they ended up being displaced. I HAVE NO IDEA WHAT “DISPLACED” MEANS. The black Saturday bushfires have killed lots of people and left some people homeless. The bushfire happened on a really hot day that is the worst day to have a bushfire because it was a really hot day. I think that the bushfire happened because the grass got really hot and then the sun heated up the grass which made it start a fire then the fire expanded and then it got really huge and the smoke and the flying ashes made it a black Saturday. I think that the black Saturday bushfire were the worst bushfires ever because it killed so much people and lots of people got injured really dangerously. What do you think displaced could mean? Maybe you could infer a meaning. Why was it called Black Saturday? Why would people not be evacuating if a bush fire has happened around their area? Why did this happen in 2009? Was some of the 400 fires lit by some people? How could a single fire kill 120 people? The weather conditions on the day were some of the worst bushfire weather conditions ever recorded. Temperatures reaching 46 degrees. Disastrous conditions was 2 months of extremely low rainfall and hot dry conditions. Black Saturday got its name from all the black smog that could be seen from a massive distance. If you went into the smog then you couldn’t see. People wouldn’t evacuate if a bushfire happened around their area because they think the bushfire isn’t going to come for them so they are in risk of danger. I think that the Black Saturdays fire was a destructive machine tearing everything up in its way. I think that living around the area of the bushfire would be a curse because a fire has already happened so it could happen again. Since the area is full of dry trees the fire can spread easily. I think that the Black Saturdays fire was caused like a natural disaster but got way out of hand and spread too much. What were the conditions on that day? How hot is 46 degrees? Is 120 kph winds bad for bush fires? Why did they call it Black Saturday? 7th January 2009 Victoria, Australia. The Black Saturday bush fires killed 173 people and injured 414 people. It is estimated that the energy released from the Black Saturday bush fires was the equivalent to 1,500 Hiroshima atomic bombs. The conditions was 2 months of extremely low rainfall and hot and dry conditions. 46 degrees is extremely hot. 120 kph winds is very bad when there is a bush fire because that makes the fire spread. They called it Black Saturday because it left things black. The Black Saturday bush fire was majorly destructive. I was very bad conditions before the Black Saturday bush fires started. The Black Saturday nobody apart from firefighters were trying to control the fire and when the firefighters got there is was really big and out of control. Why do they call it black saturday? Why was there 400 fires? How did the 173 people die? How badly did the 414 people get injured? 7th, February, 2009, Australia, Victoria. 2 months of extremely low rainfall and hot dry conditions. The radiant heat produced in some instances was capable of killing people from 400 metres away. It was estimated the energy in the Black Saturday bushfires, was equivalent of 1,500 Hiroshima atomic bombs. They call it black Saturday because when it burns everything it all turns black and sometimes the air can turn black from the ashes. 46 degrees is extremely and boiling HOT. There was 400 fires because the first fire was creating more fires. 173 people died because there where 400 humongous fires. Half of the 141 people needed to get surgery and stiches and the rest of the people needed to sleep. Black Saturday bush fire was a deverstating and humoungous fire, it killed 173 people and badly injured 414 people, was very bad conditions before the Black Saturday bush fires started. When the fire started it got bigger and went out of control. How was black Saturday bushfires started and what had caused it? How did the fires reach so many places to destroy so many homes? How did others help the people that were dying when so many other people were dying as well? Who saved the 414 people that were getting injured in the bush fires? I think having 2,100 homes destroyed, 173 people killed and 414 people injured, is very important because not many people are caused in such big disasters. I think having 400 hundred fires started I the whole day is really important because it’s not really that lucky, when you are stuck in so many fires. I think having 120 people killed by a single fire in the Kinglake area alone is very important because that is average in a single fire. I think the black Saturday bush fires were caused by people leaving fires lit up or others purposely lightning fires to start all different ones. I think the fires reached so many places because someone could have lit up one fire which had made one huge fire. People could have lit certain fires in different places. I think families saved the 414 people that were getting injured because you would think people would save there own families or themselves. I think the bushfires were cool for some people and annoying for others because the people that were in the fires would think it was annoying people that weren’t they wouldn’t think it was bad. I myself I thought it was cool but dangerous.